What Is a Pint of the Black Stuff? Any self-respecting beer drinker will know the answer to the question "What is a Pint of the Black Stuff?" But for those who are not so familiar with the term (heard more often in Ireland), it is quite simply Ireland's national drink, Guinness. 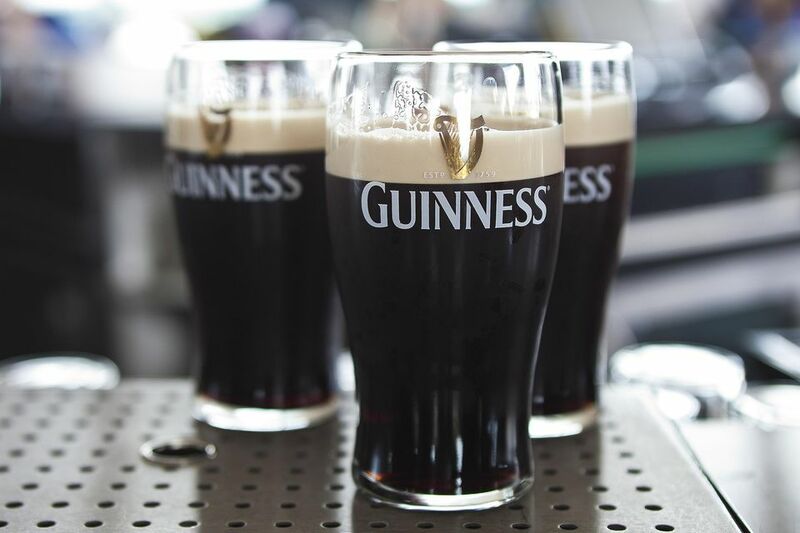 A pint of the 'Black Stuff' as it is often referred to is actually a pint of the famous Irish dry stout, Guinness. Guinness is a descendant of an 18th-century English porter style ale, though today Guinness is one of the most famous drink brands in the world. Guinness is one of the leading brands in the world thanks, not only because of the popularity of the ale but also for their aggressive marketing. The result of which is many of the iconic advertisements of the 20th century. Much of this work, the history and the making of Guinness can be seen at the Guinness Storehouse in Dublin. A glass of Guinness is a welcome drink alongside many hearty Irish dishes, its strength of flavor though can be a little dominating, so you may love to cook with Guinness. Adding to Guinness to a recipe bring an added flavor which can be slightly bitter, yet with a sweet maltiness at the same time. Use Guinness in any recipe which calls for a dark ale, a stout or a bitter (as in a beer bitter not a bitter flavor). Interestingly, Guinness works in both savory and sweet dishes. Have a look at these recipes. Guinness Rarebit Recipe - A simple take on a Welsh Rarebit but with a splash of Guinness for extra flavor. Super Simple Guinness Bread Recipe - Yes, you can add Guinness to bread and well worth trying for the lovely malty, slightly bitter flavor. Beef and Guinness Pie - What must be the most famous (and most popular) recipe using Guinness. A classic of the British and Irish kitchen. Guinness and Orange Moist Chocolate Cake Recipe -There is no denying the beauty of this cake is the balance between the orange and the Guinness which come together in a cake which is not only moist but also bursting with taste. A real winner of a recipe.